Gillian Triggs(LLB 1967, PhD 1982, Janet Clarke Hall and International House) offers a businesslike handshake and beams an intense, penetrating power gaze. It’s instantly clear that a mistake has been made; the President of the Australian Human Rights Commission believes I’m at her Sydney offices for a job interview. With the error corrected, Emeritus Professor Triggs, a noted international lawyer, softens. “This should be much more pleasant,” she says with a smile, her blue eyes widening. The conversation turns quickly to the Commission’s inquiry into children in detention and her recent visit to the Christmas Island immigration facility, where 315 children are held behind a wall of wire. She describes the conditions as “disgraceful”, and the adjective is uttered in an emotional minor key. “It’s really heartbreaking to be there,” she says. Having been offered a glimpse of Gillian Triggs woman of steel, thanks to a case of mistaken identity, a woman of compassion is now laid bare. It’s clear that both qualities are needed to operate effectively in the politically charged arena of human rights. Triggs was born in London in 1945 to parents who both served in the war. Her accent still bears the imprint of a middle-class English childhood. This “Paddington Bear” life, as she calls it, may have been socially conventional, but it was ethically broad, humane and sympathetic. En route to Australia as a 12-year-old, immediately after the British and French invasion of Suez, she vividly remembers the poverty in Aden and Cairo and its effect on her. “I realised at this time that I’d come from a terrace in north London and was looking at a wider world.” When, more than a decade later, she graduated with a law degree from the University of Melbourne and a specialisation in international law, she headed to the United States to work as an adviser to the Dallas police chief on civil rights legislation. That “wider world” became her world. She has inhabited it ever since. “I was hugely stimulated by the United Nations Universal Declaration of Human Rights from 1948, in which Australia and ‘Doc’ Evatt played such an important role, and in particular how these ideals, once articulated, are implemented,” she says. Along the way, as she sees it, fortune favoured her. “I was lucky enough to do Melbourne law and then, after my PhD in 1982, to walk into a lectureship. That wouldn’t happen today.” Until 2005 she was director of the University’s Institute for Comparative and International Law. She has also practised commercially as a barrister and consultant. Triggs took up her appointment as President of the Australian Human Rights Commission in August 2012 after five years as Dean of Law and Challis Professor of International Law at the University of Sydney. A little over a year later a Liberal-National Party Government was elected. If she harboured any illusions about the difficulties of championing human rights under a Coalition Government nettled by Andrew Bolt’s transgression of the Racial Discrimination Act’s controversial section 18C, they were dispelled in the last week of March. This was the week in which Attorney-General George Brandis, after first declaring that “people do have the right to be bigots”, announced plans to repeal sections 18C and D of the act. It comes as no surprise that Triggs, wary of attempts to position the Commission as a creature of the left, is keen to emphasise its breadth. Indigenous social justice, women, age, gender, children, disability, freedom; all come within its bailiwick. Triggs notes the Commission’s work on the new disability insurance scheme, the military’s gender culture, and a $12 million project on bilateral human rights with China and Vietnam commissioned by the Department of Foreign Affairs. Much of her own work as President is focused on issues around asylum seekers, in part because she has the power to hold an inquiry and compel evidence – an example is the new children in detention inquiry. She concedes, though, that she faces a dilemma in her management of the body’s public face because the lightning rod issues grab all the attention. “Our work on asylum seekers and racial vilification are very important and of course the public is interested in them,” she explains. “But those who object to the Commission’s position in those areas tend to transfer that concern to other areas of our work, and in that sense I’m attempting to defend the quality of the work we do most of the time here. The Commission operates independently of government, even though it is government-funded. But after criticism from Brandis that it “has become increasingly narrow and selective in its view of human rights”, it is undergoing a period of reorientation. 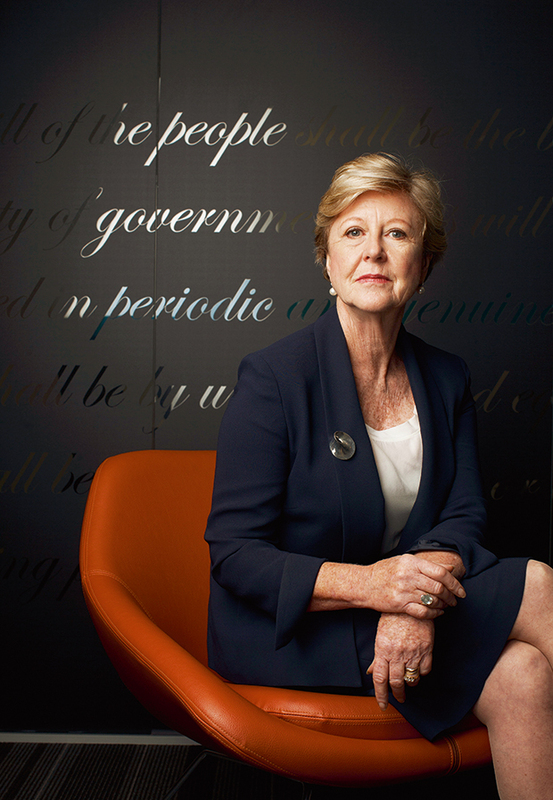 It’s hard to imagine Gillian Triggs with a use-by date, and not only because questions of human rights and freedoms, as vexed as they are, animate the big international issues of the day. She seems to have burned brightly from a young age. Before leaving I ask what she does to unwind. “I’ve just been riding around Paris on a motorbike,” she says. And there it is again: that blue-eyed smile.